Bangkok, where skyscrapers sit side by side with teak-lined shophouses, is easily one of the most eclectic cities in Asia. It’s a popular place to visit, combining culture, nightlife and fantastic food. Despite its quick socio-economic rise and cosmopolitan vibe, the city has remained a great value, with cheap public transport and bargain taxis. Accommodation is plentiful and affordable. Don’t worry about picking up a guidebook before you arrive; bargain local magazine Bangkok 101 (released monthly) is a great resource—a combination of what’s going on with an easy-to-use Bangkok guide section that includes a whole directory on shopping, restaurants, attractions and nightlife with the names handily printed in Thai (which is handy when the taxi driver displays his confused face). A free weekly mag to check out is BK Magazine, which also has a great mobile-friendly website. 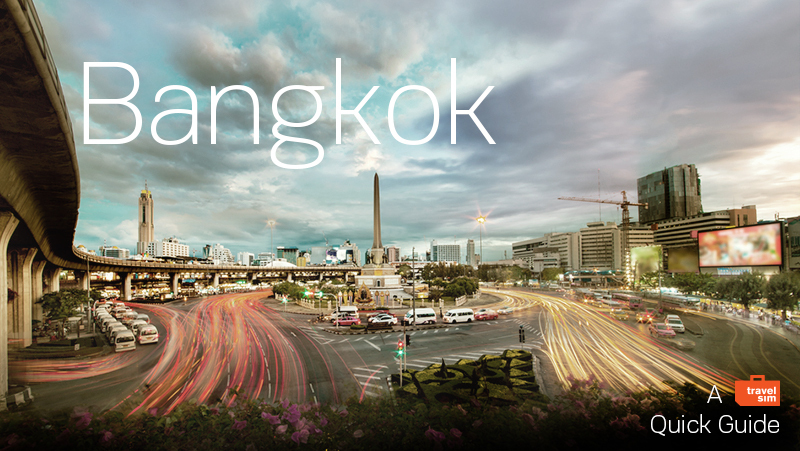 Bangkok’s main thoroughfares are numbered, making it (theoretically) easy to find your way. For those areas which are trickier to navigate, such as Chinatown and Chatuchak Weekend Market, then there’s only one map worth having in your pocket: Nancy Chandler’s. This can be purchased at most bookshops around the city, and it is hand-drawn. Richard Barrow is the blogging man in the know with a range of sites including Bangkok for Free and Thai festivals. Other great bloggers include Eating Thai Food, which covers a wide variety of eateries (from street food stalls to up market restaurants) and has a handy map which pinpoints all their reviews by location. Krungthep 101 is another favourite blog, covering food, attractions and shopping destinations. Last but not least, we love this cycling blog, especially now that Bangkok has embraced city bike rental points. The Twitter community is very active in Bangkok and tends to respond to all kinds of queries about what to do and see, especially if you ask about something unusual. Check out Bangkoking, an account run by a different Bangkokian every week, and Richard Barrow (he’s everywhere!) for what’s going on that day in the city. Sight-wise, it’s easy to avoid the crowds in Bangkok. Instead of the Grand Palace, check out the Golden Mount and Loha Prasat, both with tiny entrance fees and limited visitors. Spurn Bangkok’s popular Lumpini Park for Rama IX Park on the edge of the city, and check out the Bangkok Art & Culture Centre for all things creative. Street food is another big part of the city. If you’re feeling wary, then head to Sukhumvit Soi 38 for bargain bites and arguably the best mango sticky rice dessert in the city. The adventurous should just follow the buzz. Some street restaurants even have a 30-minute wait, a good sign the food will be tasty. When night falls, enjoy cheap beers at Cheap Charlie’s and then party with the locals at RCA. Bangkok is a busy and diverse city that will always be in charge, from the weather to the traffic, so the best way to enjoy it is to take it slow and soak up your surroundings. Claire Mykura is a British expat living in Bangkok, and her blog is called Bangkok, I Love You. BANGKOK – DUSK TO DAWN from Florian Böhm.